Rocks can be a very boring topic. Teaching the rock cycle and getting students to engage with rocks can be difficult. 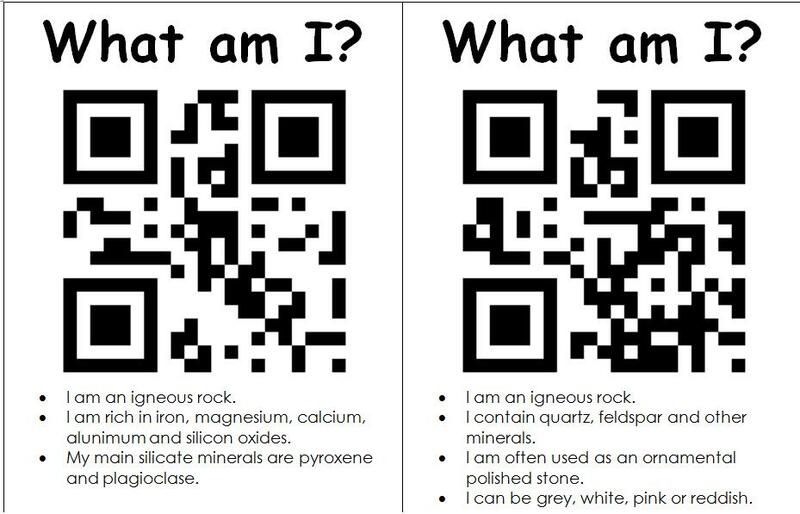 I’ve been exploring the use of QR codes in the classroom lately and have come up with this idea to make looking at rocks a bit more fun. This activity requires the Common Rocks Reference app and a QR reader app on an iPod, iPhone or iPad. Organise samples of basalt, granite, gabbro, gneiss, phyllite, schist, slate, conglomerate, limestone and shale and place them around the classroom. Label the samples 1, 2, 3, etc. Place the corresponding QR code card next to each sample. Students can work in small groups to rotate through each sample. They can read the clues under the QR code and use the Rocks app to guess what rock it is then scan the QR code to reveal the answer. This activity can be turned into a “Who is the best geologist” game and have groups of students competing against each other to see who can identify the most rocks correctly. A more detailed version of the activity with all the QR codes for the rocks can be downloaded here, QRcodes_rocks. This entry was posted in QR codes by Alice Leung. Bookmark the permalink. Thanks for sharing this Alice. It has inspired me to make a few other activities in science using QR codes. Reblogged this on Riley's Awesome Blog.